The date system (DS) is managed with the Bump column. 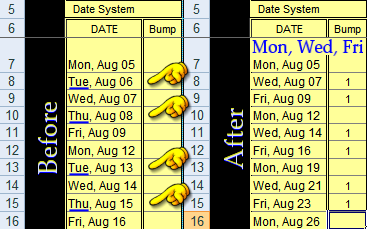 In V3+, the Bump column is yellow and to the right of the Date Column. The column is labeled Bump. Using the Bump column is fairly easy; it’s just a matter of simple math. With math, by entering a 1 or 2 or other number into the bump column next to a date, you are subtracting the date, moving dates forward by the number placed in the column. It is probably not a good idea to plan the class sequence months in advance unless you know that nothing will change your schedule. I recommend setting a class sequence no more than a few weeks in advance. Read below to find out what I mean by Class Sequence. You can safely skip the crazy example that is next on this page.